Applying for a PAN card online is an easy process that does not require submission of documents via post or courier. If you have lost your PAN card or if you want to change name on PAN card or update other details, then you can follow another simple process that is completely online. This process will allow you to apply for a reprint of your PAN card or to get any errors such as incorrect name, photo, date of birth, etc updated. The following steps are for revision or reprint of PAN card for individuals only and they may vary if you’re applying for a PAN card under other categories such as trust, company, or limited liability partnership. 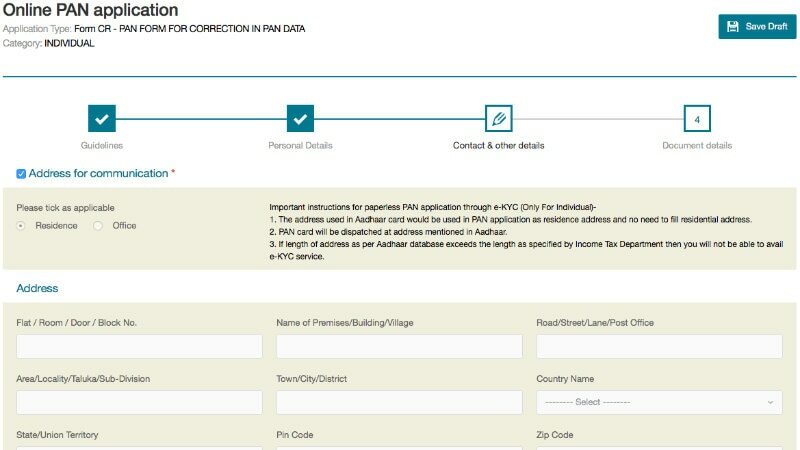 This guide covers all kinds of corrections on your PAN card, including name changes. There are several reasons why you may need a name change on a PAN card such as incorrect spelling, or you’ve actually changed your name (perhaps due to wedding or any other reason). The method described below involves Aadhaar eKYC, so if your name is correct on Aadhaar card, you can follow the steps below and get it changed on PAN card. If not, you will need to submit documents showing that your name has changed or has been printed incorrectly. These documents include publication of name change in an official gazette, marriage certificate and wedding invitation (along with a document to show the name of your spouse), or other valid documents with the correct name such as a passport. This document depends on the reason for your name change, and you will find out which one you need as you go through the process below. The list of documents needed for revision of PAN card is the same as that for applying for a new PAN card. You need documents for identity proof, address proof, and date of birth. See the full list of accepted documents required for updating PAN card details online. These steps will help you send in your application to revise or reprint your PAN card. You can get your PAN card reprinted or revised via NSDL or UTITSL websites. We did this via the NSDL website and the steps below will reflect that. First go to the NDSL website. Click on the drop-down menu under Application Type and select Changes or Correction in existing PAN Data / Reprint of PAN Card (No changes in existing PAN Data). Now fill in all the details, enter the captcha code, and then click Submit. In the next step you can choose how you want to submit your PAN documents. This can be done via an e-KYC that needs an Aadhaar card, via submission of scanned images through e-Sign, or by physically sending documents. We chose e-KYC via Aadhaar so the steps will vary a little if you choose one of the other methods. Fill in all the fields marked with a red asterisk (star) and then click Next. Enter your personal details in the fields marked with a red asterisk and click Next. Make sure that all these details are exactly as mentioned on your Aadhaar card. 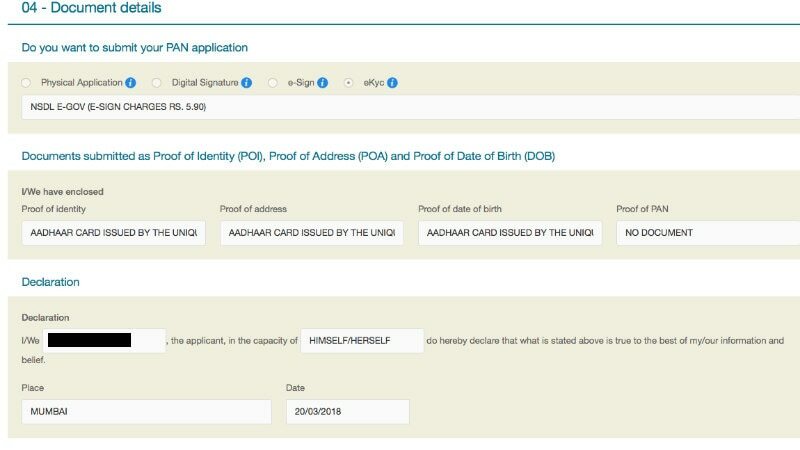 If there is a mismatch, you will not be able to authenticate via Aadhaar until you fix it and you only find out if there is a mismatch after paying. In case there is a mismatch, you get a refund but to avoid this, double-check all details right now. Now select the document you want to submit along with your application. We clicked on eKYC, filled all the details, and then clicked Proceed. Now you will see the fee (excluding online payment charges). Revision of PAN card or reprint of PAN card costs around Rs. 120 (all inclusive) for Indians and around Rs. 1,040 for those outside India. Click Pay Confirm. Enter your payment details and finish the payment process. Then you will see a page that tells you if the transaction was successful. If it was, you get a bank reference number and a transaction reference number. Save these two and then click Continue. Now you will have to authenticate via Aadhaar. Below your Aadhaar number, tick the box and then click Authenticate. If your personal details match with what’s mentioned on your Aadhaar card, click Continue with e-Sign / e-KYC. Tick the check box and then click Generate OTP. Enter the OTP and then click Submit. Now you will reach a page where you see your application form as it was submitted. Download this in PDF format and store it somewhere. You will also receive the acknowledgement via email. That’s the full process to update or reprint PAN card online. Once your application has been processed, your PAN card will be printed and sent to your address.